WASHINGTON - From a beer at a ballgame to a wine tasting with friends, alcohol is a regular part of life for many Americans. However, some experts say the health risks of alcohol should not be taken lightly. A new study finds alcohol use is responsible for almost one in 10 deaths among people ages 15-49 across the globe. And it concluded the only safe level of alcohol consumption is no drinking at all. As a treatment consultant with American Addiction Centers, Joan Burger-Holt said she's seen how alcohol abuse can damage lives, and believes it's just as serious a concern as the opiate crisis. "The opiate, it's a snap of the finger. You can overdose just like that," Burger-Holt said. "Alcohol, it's a slow-dying death. Alcohol is an equal crisis. It does not get equal attention." According to the U.S. Surgeon General, about 88,000 deaths are attributable to an alcohol-related cause - more than twice the estimated number of opioid overdose deaths. For those age 15-49, the study found tuberculosis, road injuries and self-harm are the leading causes of alcohol-related death. For ages 50-plus, it is cancer. 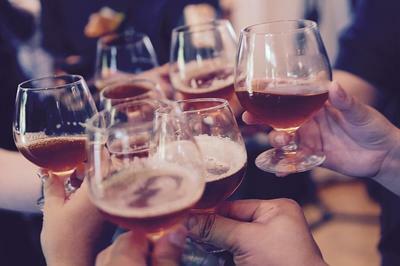 Although many studies have touted the health benefits of moderate alcohol use, such as drinking red wine, this study contends that research should be re-evaluated. Unlike illegal drug use, Burger-Holt pointed out that drinking alcohol is socially acceptable. In her view, that makes it easy to disregard its dangers, even from the depths of addiction. "A lot of times I'll see clients that are in hospital, and they're physically ill, kidneys shut down, liver has shut down, they can't breathe on their own. Oftentimes they go into a coma, alcohol poisoning," she said. "But in their mind, they don't have an alcohol problem; they're still there for a medical problem." Burger-Holt said she understands there are varying perceptions of the amount of alcohol consumption considered safe. And she recommends people consider health risks that could make drinking particularly dangerous for them, such as a family history of addiction or mental illness. "A lot of times, people will self-medicate, drink, because they had a hard day at work. Well, that could be detrimental," she said. "Or people could drink to relieve their anxiety, or drink because they're depressed."